Insights hidden within your data hold the key to the perfect customisation and optimisation of business travel costs. Real-time capture and analysis of data helps optimise travel costs for corporate clients to create solutions that result in transactions at effective price points. 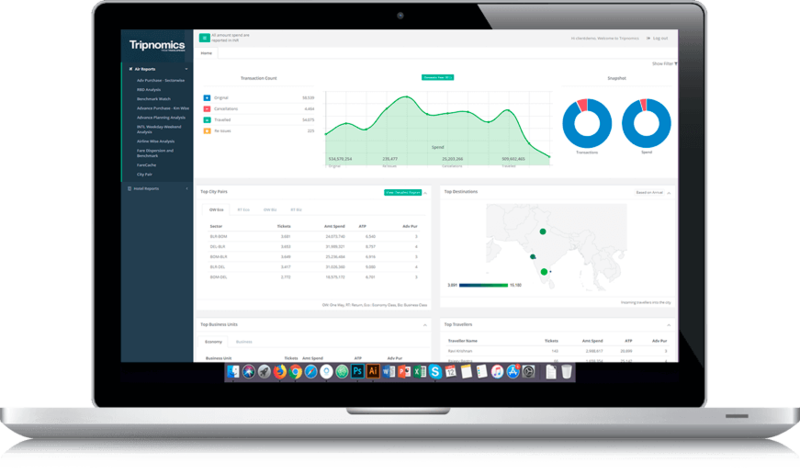 Using an unbiased approach, Tripnomics brings in transparency between procurement of fares from multiple suppliers and its usage in business travel. Travel prices change dynamically, sometimes even by the hour. Therefore, real-time monitoring becomes vital for business travel. Exercise strict control over your business-travel costs by keeping a close watch over spends and buying behaviour. Insights are collated from data that is captured real-time from multiple websites, apps and travel services to devise a cost-effective travel plan. On-surface analysis is like the tip of an iceberg. Diving deeper into data provides detailed insights that can help optimise business travel costs. Changes, updates and new regulations – Tripnomics is up-to-speed with all the dynamics of the business travel domain. Data serving as key guiding points in making decisions on preferred airline, employee travel policy, etc.